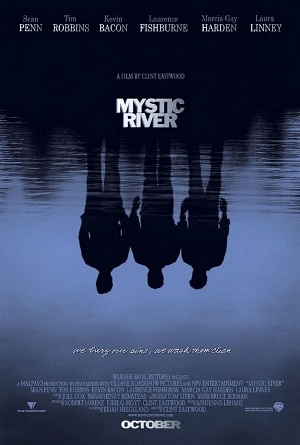 Tag line: "We bury our sins, we wash them clean"
Clint Eastwood's Mystic River is a film about faded hopes and crippling loss, relating the story of a trio of friends who share a past that refuses to let go. Jimmy (Sean Penn), Sean (Kevin Bacon) and Dave (Tim Robbins) grew up together in a working-class area of Boston. Over the years, Jimmy's spent some time in jail, but now runs his own corner store, and is a respected member of the community. He’s married to Annabeth (Laura Linney) and has several children, including 19-year-old Katie (Emmy Rossum), a daughter from a previous marriage. Sean works as a homicide detective, patrolling the streets of his old neighborhood with partner Whitey Powers (Laurence Fishburne). Dave is married to Celeste (Marcia Gay Harden), and has a family of his own, yet can't shake the memory of that terrible day when, as a kid, he was abducted by two child molesters and held against his will for three days. Then, one sunny morning, Katie is found murdered in the park, and Sean is assigned to the case. A grief-stricken Jimmy demands that Sean work quickly to find his daughter’s killer, but the finger of guilt points in a direction neither would have believed possible. The night of Katie's murder, Dave had come home with blood on his hands, telling Celeste he'd just beaten, and possibly killed, a mugger. Yet when Dave continually changes his story, Celeste starts to suspect he may have had something to do with Katie's death. Now, Sean has to work fast to to crack the case before Jimmy decides to take the law into his own hands. The events of Mystic River form around a fine ensemble cast. Tim Robbins, who won the Academy Award as Best Supporting Actor for his turn as Dave, strikes the perfect balance of loving family man and tormented soul. It's clear from the outset Dave is buckling under to the memories of his past, and might have finally reached his breaking point, with tragic consequences. But the strongest performance is delivered by Sean Penn, whose Jimmy is a devoted family man, yet not above playing it tough when necessary. Jimmy has suffered a tremendous loss, and in Penn’s capable hands, the character explodes with emotion, from the moment he learns his daughter is dead to the conversation he has with Dave on the back porch, where, realizing his anger has taken control of him, Jimmy breaks down, finally allowing himself to mourn for Katie. Then there’s the Boston neighborhood, which is as much a character in Mystic River as any. It’s a close-knit community, where generations have raised their families, but there’s also a pain in this town that defines everyone living within its borders. There is heartache in Mystic River, and before the film is over, it will have consumed everything...and everybody...in its path.